This glass confetti pendant is fused on a white base with Bullseye confetti scattered on top. 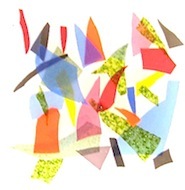 Confetti are very thin shards of fusing glass that can be purchased by the jar in a range off colors. Available also in a rainbow mix that has been used in this project to produce the contrasting color effects. This pendant is very quick and simple to make. Colors and size can be changed quite easily. Two pieces of white Bullseye glass 11/4" square. Bullseye confetti (can be purchased by the jar). Step 1. Cut white base to size. Step 3. Stack pieces on prepared shelf and scatter confetti on top. Check to see that is fully fused, if so, turn off and allow to cool to room temperature. Step 5. Remove item, roughen up small area on back of item with sand paper. Use two part epoxy glue to glue metal bail to roughened section.